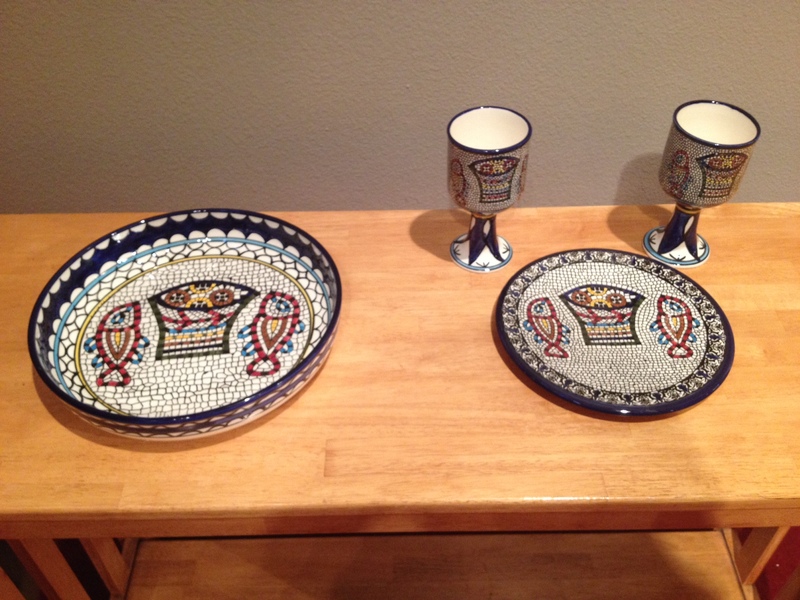 On Sunday, August 3, 2014, we dedicated a new set of communion ware and a baptismal bowl for use at MLLC. These depict the miracle of the Feeding of the 5000 as noted in all 4 Gospel books. Our Gospel reading for the day was Matthew 14:13-21. The pattern on these new chalices, paten (bread plate) and baptismal bowl is taken from the design of a Byzantine mosaic which adorned a church building built around AD 480. This was just in front of the altar at that church building. The church was buried over for many centuries, but was rediscovered by German archaeologists in 1932. In 1982 a church building was dedicated which now preserves this beautiful and meaningful mosaic. 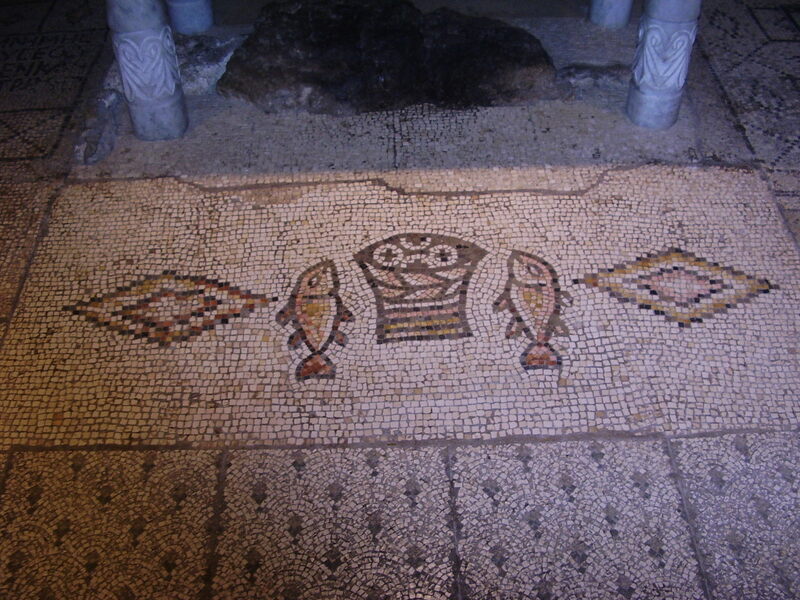 The mosaic depicts 4 loaves and 2 fish, but the account in the Gospels refers to 5 loaves and 2 fish. It is commonly understood that the “missing” 5th loaf of bread is the one which is used for the Holy Communion at the altar above the mosaic. The modern church building is called, “The Church of the Multiplication”. The original church building was placed in this location to commemorate the great miracle of the Feeding of the 5000. Some early Christians considered this to be the location. There is some debate about this being the actual location. Here is a photo of the original mosaic from the church building in Tabgha in the Holy Land. Tabgha is located on the Northwestern coast of the Sea of Galilee. Here is a link to an article about the church. Here is a link to an article from 1984 about the restoration of this ancient Christian church building. I am at Calvary Episcopal Church in Golden Colorado. 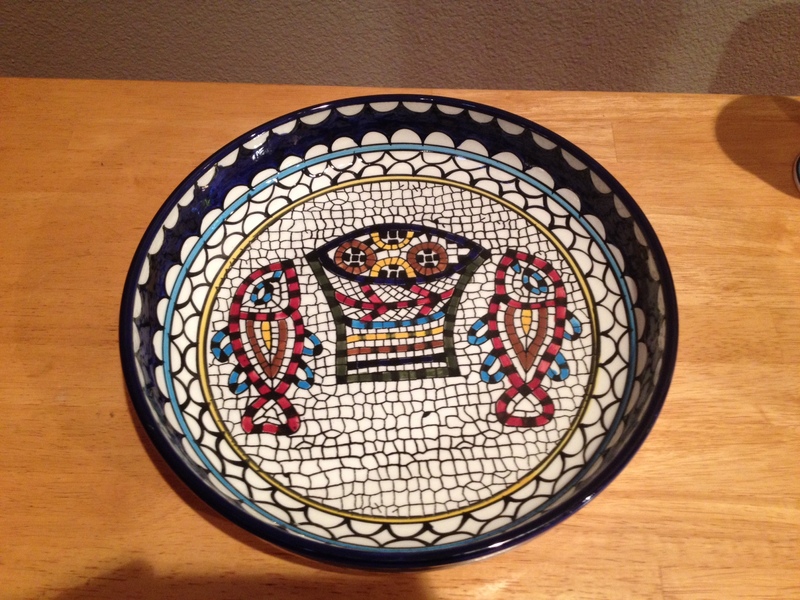 We would like to purchase two patens with raised edges with the Tabgha mosaic that are in your photo. I cannot find them online. Please give me the contact information for where you purchased yours. Thank you! There may be other sizes or other vendors for this item on Amazon, or other sellers.